The most common Big Bang models predict an isotropic high energy density with a so called initial isotropic but contracting Quark Gluon plasma as the beginning of Galaxies. However what astronomers observe in the early universe are the most colossal Black holes and even Massive Galaxies. What is the reason that massive galaxies and colossal black holes where formed so quickly in the early universe? 1: that the big bang could be compared with the “splitting” of the colossal Big Crunch black hole, as remnant of a contracting and imploding former Universe. These first splinter black holes should be the “colossal black holes”. 2: That these colossal Black holes are responsible for the fast production of Quark Gluon plasma and the concentration of Mass into so called “bullet” spiral galaxies. 3; That we need a new paradigm for Black holes and the energetic Higgs vacuum. 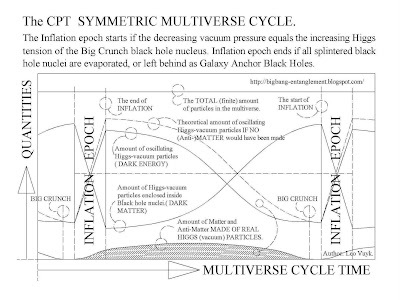 Based on symmetry reasons, there is reason to accept that we even live inside a cyclic or “bouncing” multiverse. 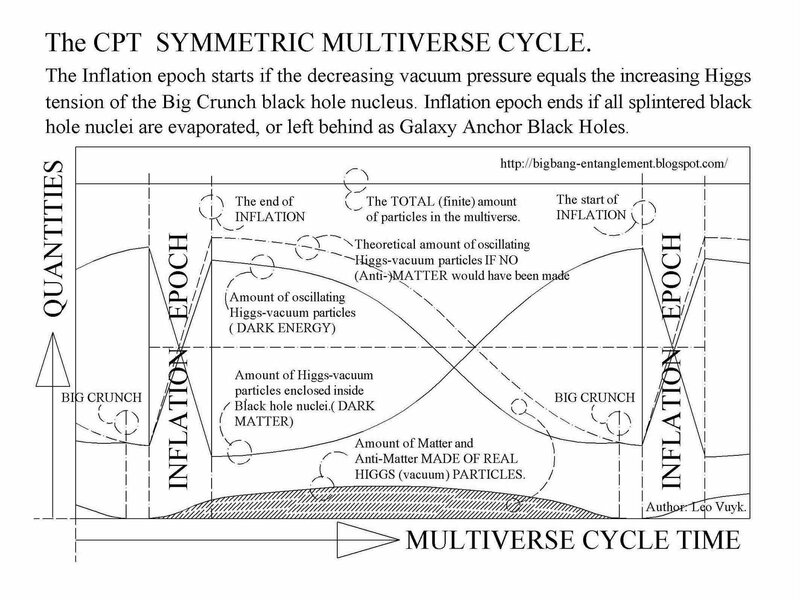 At the end, all the mass and Higgs space of our universe will end up inside the Huge Big Crunch black hole. 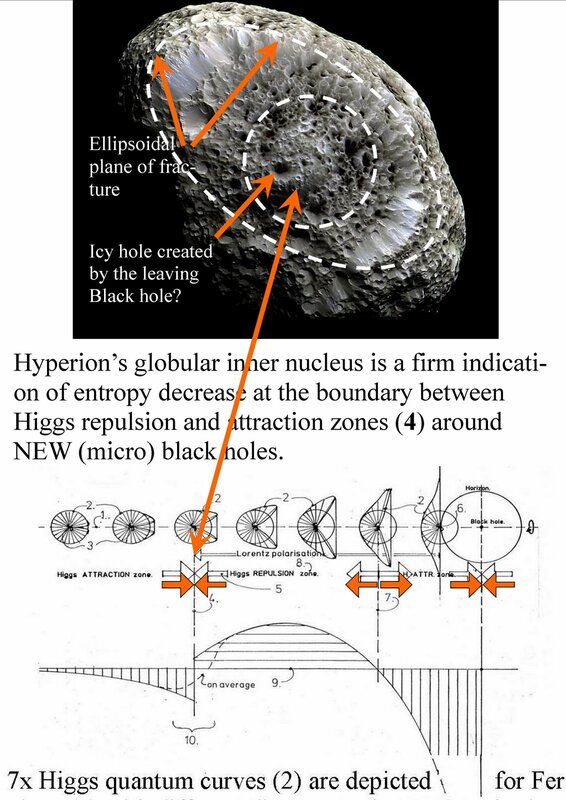 If we assume that the Higgs space itself is the origin of so called Casimir force, and the energy source for all motion, even for fermion spin and the outside pressure on black hole nuclei, then we could construct an ontological sound picture of the cyclic universe. Examples of NEW PARADIGM Splitting and Pairing Accelerated MASSLESS Black Holes. The findings of Putman et al., imply that loggerheads have a navigational system that exploits the Earth's magnetic field as a kind of bicoordinate magnetic map from which both longitudinal and latitudinal information can be extracted. You won't believe this compass reading, perpendicular to the Permalloy tube axis! It is just turning at 17 degrees elevation of the tube. Indicating that both monopole waves entering the tube, have equal strength. Don't do this with an electronic compass, it will flutter from left to right and become wild. 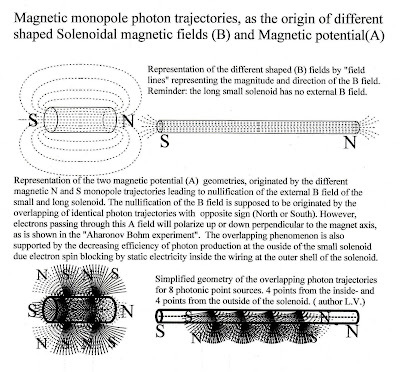 Comparison of theoretical monopole photon bubble distribution, emitted from a bar magnet and from the Earth. TWO DIFFERENT MAGNETIC MONOPOLE VECTOR ARRAYS. 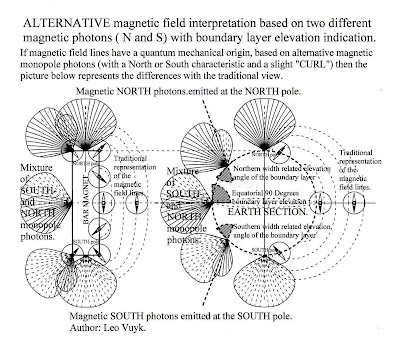 Alternative magnetic field interpretation based on two different monopole photons (S or N).Two different magnetic photons ( South or North) are emitted from every single surface point by a bar magnet or the Earth represented in the form of two different CONE SHAPED VECTOR ARRAYS, also called VECTOR BUBBLES. These arrays are supposed to be the ONLY origin of the direction of each compass needle and the magnetic lines of equal strength: representing the so called B field.The Paramagnetic tube (Permalloy, or Mu-metal) mentioned before is supposed to REFLECT all magnetic radiation vectors. As a result only the magnetic radiation which is as a vector in line with the central tube axis, will pass through the open tube and influence the compass.! 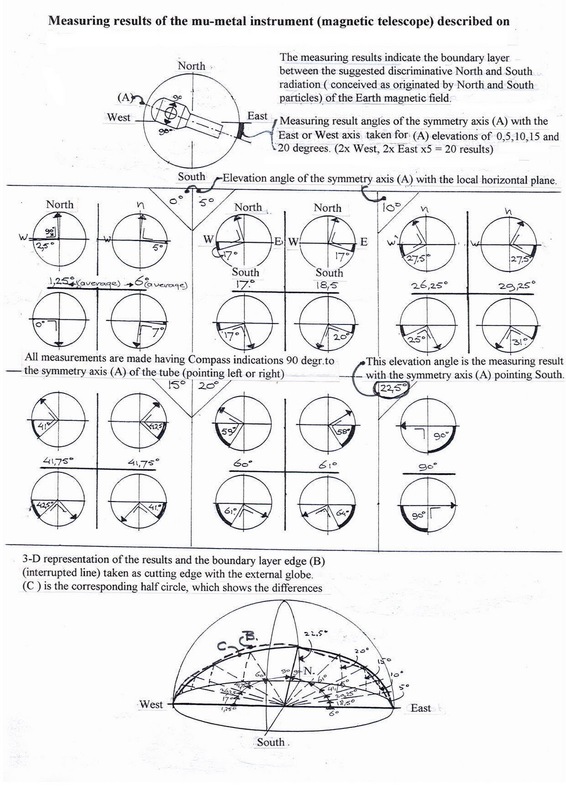 !If the mixture of the two monopole vectors is 50-50%, then the needle of the compass will choose to point perpendicular to the tubular axis, as is presented before on the photos.If the monopole radiation mixture is 75-25% , then the compass needle is supposed to point under an angel of 45 degrees. If 100% singular North or South radiation passes the compass, it is clear that the needle will point exactly parallel to the tubular axis. IF THE "MONOPOLE BUBBLE BOUDARY LAYER-EDGE- B", (shaped as a bended half circle) HAS UNIGUE QUALITIES FOR EACH PLACE ON EARTH, then we have found a unique extra possibility for orientation. Permalloy/Mu-Metal tube for magnetic monopole boundary layer testing of the Earth magnetic field. 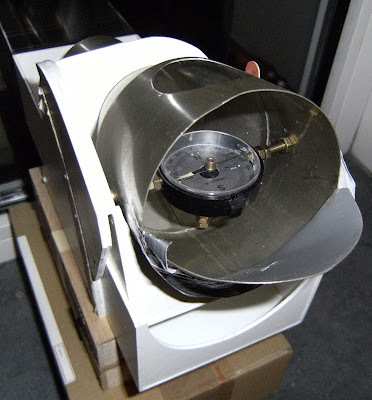 The tube which is used in this experiment, is the original shielding tube of an Oscilloscope. ( Cathode Ray Oscilloscope, CRO) . 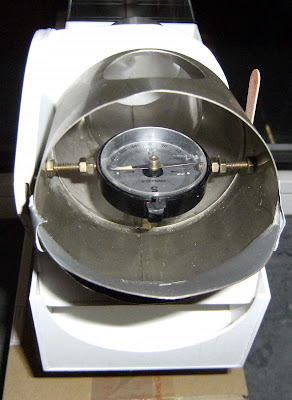 The test instrument with a simple compass. The needle of the compass is turning into a 90 degree position, perpendicular to the axis of the permalloy tube if the boundary layer is reached at a certain elevation angle. 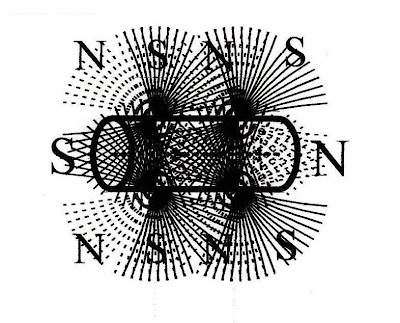 For this boundary situation, the new monopole theory says: that equal numbers of North and South photons are passing through the permalloy tube and the compass. 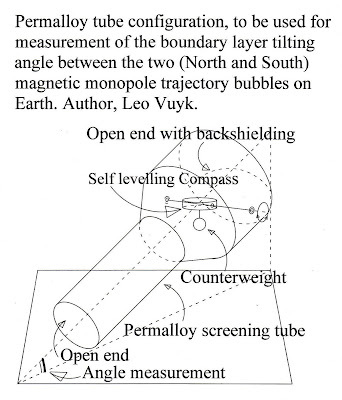 The test result of the tilting angle between the monopole bubbles are given below for the Netherlands (the town of Weesp) on 4-4-1998. The maximum angle found was 22.5 degrees elevation, aiming at the 180 degree South direction. Later at a more southern European location (island of Crete) a tilting angle of 55 degrees was found, as a firm support for the theoretical magnetic monopole model. Later measurements even suggest that this maximum tilting angle varies over the year considerably between 35 and 15 degrees and are possibly are related to the seasons. 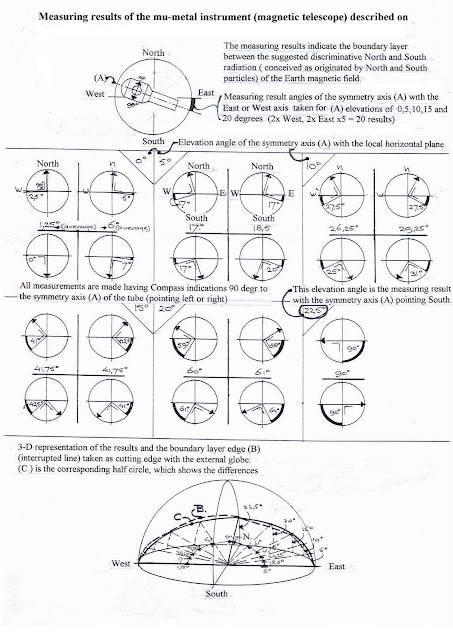 Detailed future measurements are needed at different places around the world to support this possibility.At the same time we observe, that there is a small but peculiar variation in the tilting angle "half circle profile" called "Boundary layer edge (B)" measured over the 180 degree directions from East to South to West. Could it be that (race) Pigeons, sea turtles and all other "migrating animals" are equipped with such a "monopole boundary layer edge B" measuring device and have an internal DNA memory MAP of specific season related coordinates on Earth? In that case most questions about their "migration" and homing skills could be answered. Equipped the variable monopole tilting angle information, migrating animals should be able to pinpoint their position in relation to each season. 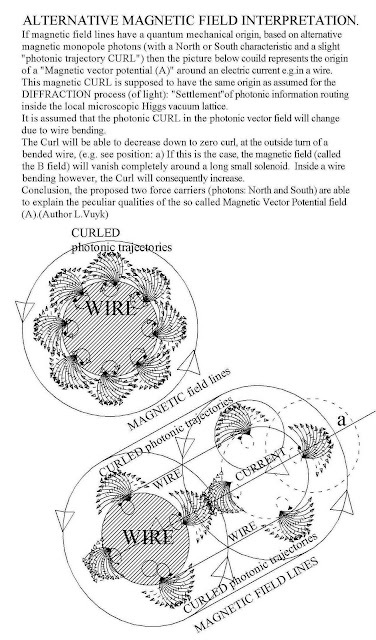 Alternative magnetic field around a wire with a current, the base for the Aharonov Bohm effect. 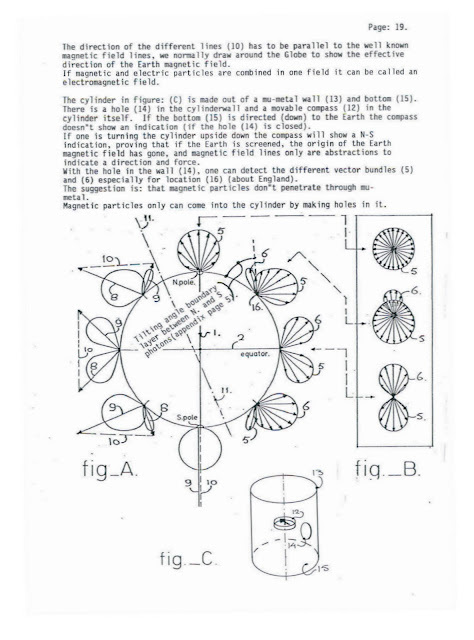 Magnetic monopole photon trajectories around solenoids and the Aharonov Bohm effect. Comet Hartley 2 hides two gas and snowball spewing micro black holes in its dumbbell shaped double nucleus. 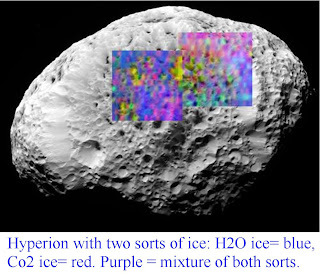 Comets seem to harbour a nuclear energy source (micro black hole) to melt nuclear ice into water! 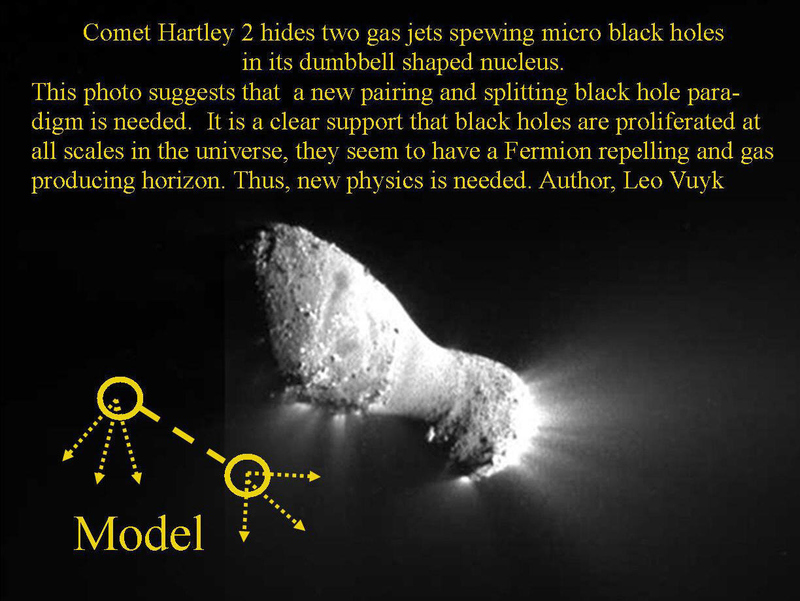 The next photo suggests that a new pairing and splitting black hole paradigm is needed. It is a clear support that black holes are proliferated at all scales in the universe, they seem to have a Fermion repelling and gas producing horizon. Thus, new physics is needed. New paradigm Micro black holes inside Comets, are supposed to be magnetic -x-ray interference products of solar magnetic storm activity. So we may speak of "interference black holes" instead of supernova black holes.